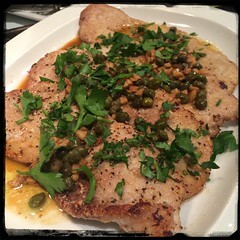 Piccata typically refers to the way a fillet is coated, sautéed and served with a lemon and caper based sauce. Typically is also made using veal, chicken or fish and we find a pork piccata also works extremely. 1. Pound the pork cutlets if not as thin as you like. 2. Marinate the pork in 1/3 cup white wine and 3 tbsp olive oil for about 1/2 hour. 3. Add the capers and let cook for a few moments. 4. Add 2 tbsp butter, let melt and then add the leftover marinade (along with 1/2 cup of wine). Let come to a simmer and reduce to about 50%. 5. Add some lemon juice and toss in some fresh parsley. Scallopini is best served with a vegetable and rice or potatoes. A light vegetable-based pasta would also work well.